Half-square triangles trimmed to 3 1/2"
for their Lady of the Lake quilt-along. I'm ready for pumpkin and cider colors! Teachers go back to school on Monday. I have to lead a PD session on Explicit Instruction. people will play along and visit after being apart all summer. Some of those bow ties would definitely count as light neutrals. Cooler evenings here but I'm not ready for fall weather yet. Yes I'm back at work Monday too 😀🤔😫 I'm going to print and start my Lady of the lake block today. Love your colors. Best of luck finding time to sew as you head back to work. Something tells me, you're going to need it!! Hope you have a good start to the school year, and good luck on your PD! Although I am a happily retired teacher, I do still get that back to school feeling this time of year. 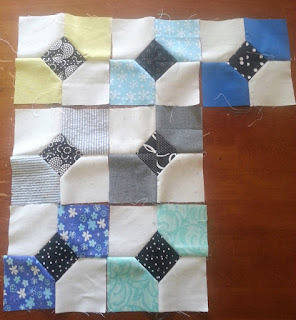 I like the way you're making your bow tie blocks with the dark center piece! Enjoy your back to school day! We started on Thursday, and so much of it was catching up. I'm sure it will be fun for everyone. 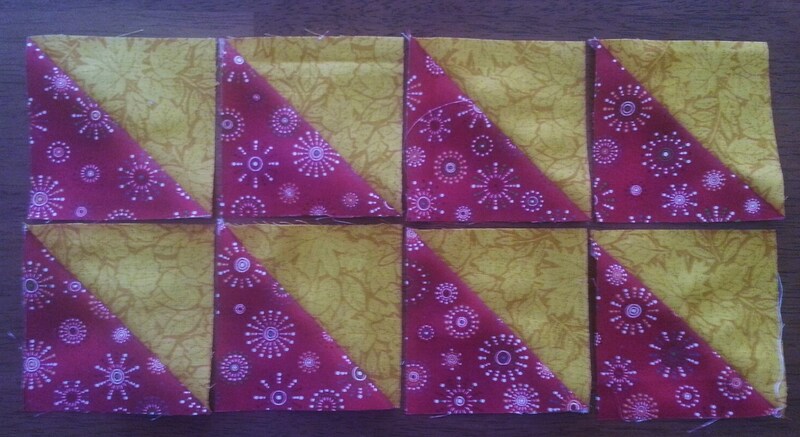 Love the purple and yellow HSTs, one of my favorite color combos. Good luck with your new school year. Hard to believe it's that time again. Those,bow ties are so restful, could almost be neutrals. 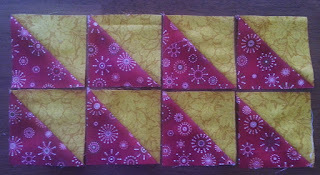 The purple and yellow HSTs are striking and will look great in any quilt.